Alain Prost won the Monaco Grand Prix for the second year running and unlike 1984 he did so without any controversy or official intervention. 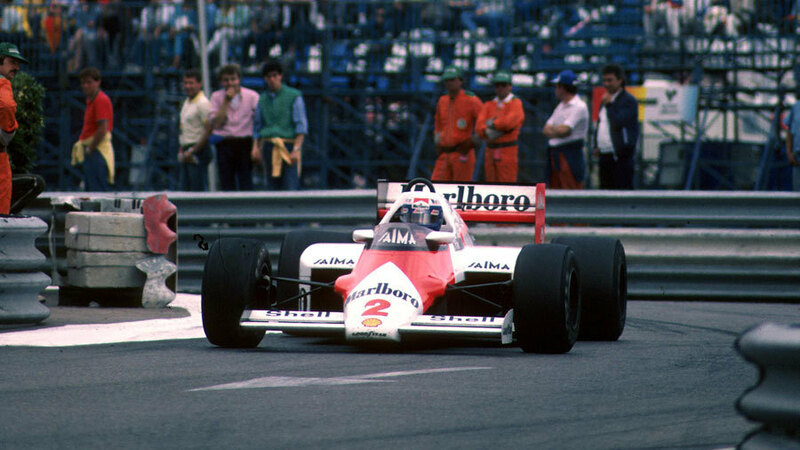 Prost's victory went some way to making up for his disqualification a fortnight earlier at Imola where he had crossed the line first only for his car to be found marginally underweight. Ayrton Senna, who had stormed into public consciousness at Monte Carlo 12 months earlier, took pole for the third successive race weekend but lasted only 13 laps as his Lotus suffered engine failure. He was to blame as he had over-revved the spare car he had to take over shortly before the start during the warm-up. As Senna led into the first corner, behind him Gerhard Berger's Arrows stuttered as its engine failed to pick up triggering a series of collisions. Patrick Tambay's Renault hit it from behind - both retired on the spot - while Stefan Johannson's Ferrari hit Tambay and retired within a lap. When Senna quit, Michele Alboreto took over the lead with Prost shadowing him. On the 16th lap a tussle between Nelson Piquet (Brabham) and Riccardo Patrese (Alfa Romeo) ended with them colliding and slamming into barriers, leaving the surface littered with debris and oil. As Alboreto passed he skidded on the oil but did well to avoid hitting anything else although that allowed Prost through. Eight laps later and Alboreto again took the lead only to surrender it back shortly afterwards when he pitted for new tyres. He resumed in fourth and again climbed back to finish second. "I knew I just had to bide my time," Prost said. "I knew I had to wait and I did wait." Behind Prost and Alboreto came championship leader Elio de Angelis (Lotus) and the Ligier of Andrea de Cesaris, while the Toleman team finally entered a race after missing three rounds because it had no tyre supplier. It was a brief appearance as its one entry - Teo Fabi - lasted 13 laps until the car's Hart engine went bang. Nigel Mansell was set to take sixth, when he slid on oil in the tunnel at 160 mph and hit a barrier. His crippled Williams was passed by Jacques Laffite.